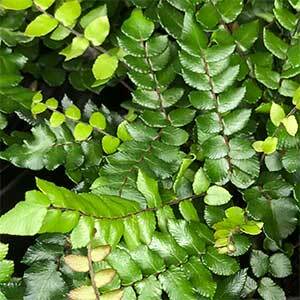 A low growing fern, Pellaea falcata nana is a great round cover plant for shaded areas of the garden. It is also suited for growing in hanging baskets as well as underplanting taller shrubs in containers. From the Eastern Ranges of Australia it grows in a range of climates from Queensland through to Tasmania. It is being to find a place in the garden where landscapers find its foliage adds texture and its easy care nature is also welcome. Common Name – Dwarf Sickle Fern. Origins – Eastern Australia rainforest areas. Height – To around 20cms.